Hydrogen powered cars have long been heralded as the wave of the future, despite strong resistance from automobile manufacturers and difficulty finding reliable fuel generation methods. Now, researchers at Purdue University have developed a way to create hydrogen for use at a temperature the engine can actually use - and without a catalyst. Hydrogen cars are slowly catching on, as environmental stewardship takes a more prominent place in the minds of the general public, car companies crumble under the weight of the economic downturn, and fears of hydrogen-car related explosions crippling infrastructure begin to subside. This is good news for Professor Arvind Varma, head of the school of Chemical Engineering at Purdue university. 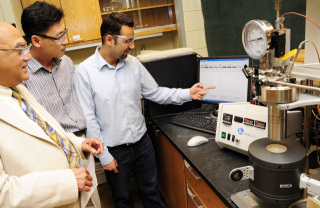 Along with his graduate students, Varma has discovered a new way to generate hydrogen for use in vehicles by combining existing methods and using the hydrogen-rich substance ammonia borane. Ammonia borane contains 19.6% hydrogen by weight, which means that a small amount will generate a great deal of the big H for fuel cell use. But the sweet H-emitting properties of ammonia borane weren't enough for Varma. Instead, he wanted to create a hydrogen generation process that could operate at or near the same temperature that a car's engine would run, and without the need for a pesky catalyst. Unitl Varma came along, there were two accepted ways for getting fuel for hydrogen cells. The first was hydrolysis, in which ammonia borane was combined with water and a catalyst in order to generate hydrogen. This didn't require a high temperature, but necessitated carrying around and periodically getting rid of your catalyst. "Morning, sir! Fill er' up? Wash the windows, throw out your catalyst?" The second method was thermolysis. In this one, the ammonia borane had to be heated to over 330 degrees Fahrenheit in order to cause the release of enough hydrogen to be useful. Varma, in true scietist fashion, smashed these two concepts together to create hydrothermolysis. Science in action: pointing at computers! In Varma's method, powered ammonia borane is mixed with water and then placed in a reactor chamber operating at the same temperature as fuel cells - about 185 degrees Fahrenheit. The reactor is kept at 200 pounds per square inch (PSI), a far cry from the 5500 PSI needed in traditional reactor systems. Lo and behold, with just water, pressure, and ammonia borane, hydrogen started flowing. 14% of the total weight of the ammonia borane and water, to be exact. This is a good number, as the US Department of Energy has set a target goal of 5.5% hydrogen production by weight in 2015. While the 14% will dip slightly once used in an actual fuel cell system, owing to the added weight, it is still far above the target set. Future work on this process will hopefully increase the range a car can drive before refuelling and develop ways to recycle waste residues created in the process back into ammonia borane. 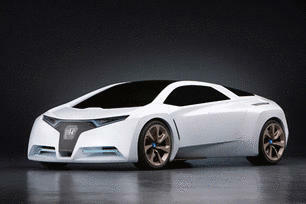 Though it may take some time, it appears that this type of technology for hydrogen-fueled cars is the bomb. Thankfully, that will no longer literally be the potential. Google Buzz Class-Action Lawsuit Could Cause Cloudburst? Breakthrough technologies such as this will make compressed hydrogen for storage on vehicles obsolete. Lets Fasttrack this R&D & place into the market.